Many years ago in the now classic textbook College Chemistry (W.H. Freeman & Co., 1954), Linus Pauling placed the symbols for hydrogen and helium at the head and center of the periodic table with arrows indicating the chemical relationships of hydrogen to two families of elements, the alkali metals and the halogens. The symbol for helium was connected by an arrow to the noble gas family. We believe an adaptation in which hydrogen is centered at the head of the periodic table has great merit (see figure) and raise this proposal for consideration and adoption by IUPAC. 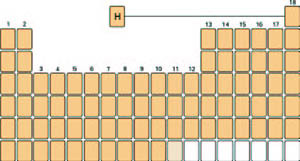 The position of hydrogen in the traditional form of the periodic table is at the head of Group 1 (the alkali metals) based on the similarity of the valence shells of this family: each of the elements possesses a half-filled s-orbital, namely, H 1s1, Li 2s1, Na 3s1, etc. However, the properties of hydrogen differ significantly from those of the other elements in Group 1. Hydrogen is a gas, not a reactive metal. The hydrogen ion, H+, plays an extraordinary and characteristic role in acid-base chemistry by virtue of its size and mass. Non-metals with electronegativity comparable to that of hydrogen form covalent bonds with that element resulting in volatile molecular substances. In contrast, compounds of the alkali metals and the non-metallic elements are ionic. Furthermore, hydrogen will accept electrons from the electropositive elements of Groups 1 and 2 to form salt-like hydrides comparable to the salts formed by the reaction of the halogens with these electropositive elements. Thus, some authors place the symbol for hydrogen at the head of Group 1 and also at the head of Group 17. We do not support the duplication of hydrogen in the periodic table. Instead, we believe the symbol should appear only once in the table, in Period 1 but centered between the alkali metals and the halogens as illustrated in the figure. This position is consistent with the elements at the head of each group being significantly different from their congeners: hydrogen lies at the head of the entire table and as such can be expected to be strikingly different from all the elements, as is in fact the case. Herb Kaesz, professor at the University of California at Los Angeles, CA, USA, is a member of, among others, the IUPAC Inorganic Chemistry Division and the Committee on Chemistry Education. Peter Atkins, professor at Lincoln College at the University of Oxford, UK, is the chairman of the IUPAC Committee on Chemistry Education. > Consecutive comments and responses: May-June 2004 CI, p. 21. Page last modified 24 July 2004.